The well-known extrasolar planet HD 209458b, provisionally nicknamed Osiris, has surprised astronomers again. Oxygen and carbon have been found in its atmosphere, evaporating at such an immense rate that the existence of a new class of extrasolar planets - 'the chthonian planets' or 'dead' cores of completely evaporated gas giants - has been proposed. Oxygen and carbon have been detected in the atmosphere of a planet beyond our Solar System for the first time. Scientists using the NASA/ESA Hubble Space Telescope have observed the famous extrasolar planet HD 209458b passing in front of its parent star, and found oxygen and carbon surrounding the planet in an extended ellipsoidal envelope - the shape of a rugby-ball. These atoms are swept up from the lower atmosphere with the flow of the escaping atmospheric atomic hydrogen, like dust in a supersonic whirlwind. The team led by Alfred Vidal-Madjar (Institut d'Astrophysique de Paris, CNRS, France) reports this discovery in a forthcoming issue of Astrophysical Journal Letters. 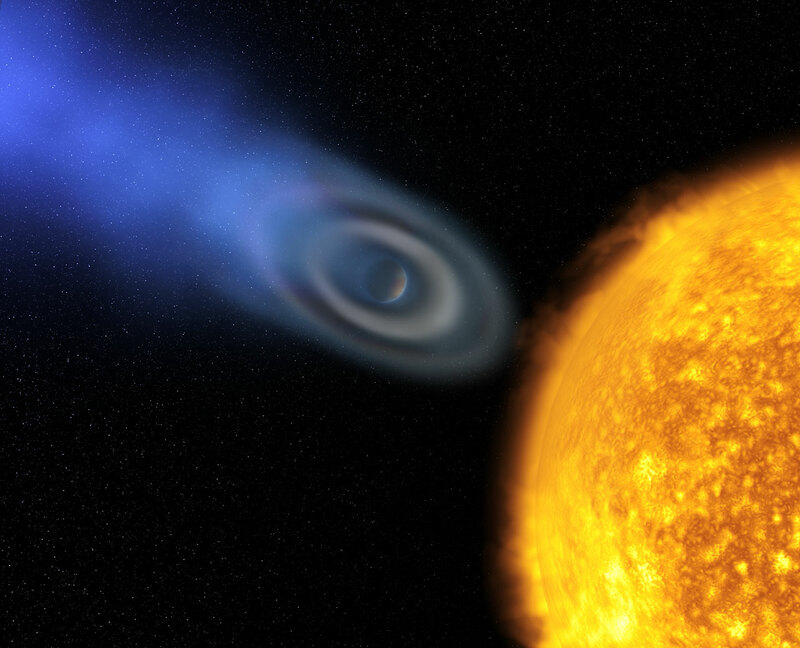 The planet, called HD 209458b, may sound familiar. It is already an extrasolar planet with an astounding list of firsts: the first extrasolar planet discovered transiting its sun, the first with an atmosphere, the first observed to have an evaporating hydrogen atmosphere (in 2003 by the same team of scientists) and now the first to have an atmosphere containing oxygen and carbon. Furthermore the 'blow-off' effect observed by the team during their October and November 2003 observations with Hubble had never been seen before. In honour of such a distinguished catalogue this extraordinary extrasolar planet has provisionally been dubbed "Osiris". Osiris is the Egyptian god who lost part of his body - like HD 209458b - after his brother killed and cut him into pieces to prevent his return to life. Oxygen is one of the possible indicators of life that is often looked for in experiments searching for extraterrestrial life (such as those onboard the Viking probes and the Spirit and Opportunity rovers), but according to Vidal-Madjar: "Naturally this sounds exciting - the possibility of life on Osiris - but it is not a big surprise as oxygen is also present in the giant planets of our Solar System, like Jupiter and Saturn". What, on the other hand was surprising was to find the carbon and oxygen atoms surrounding the planet in an extended envelope. Although carbon and oxygen have been observed on Jupiter and Saturn, it is always in combined form as methane and water deep in the atmosphere. In HD 209458b the chemicals are broken down into the basic elements. But on Jupiter or Saturn, even as elements, they would still remain invisible low in the atmosphere. The fact that they are visible in the upper atmosphere of HD 209458b confirms that atmospheric 'blow off' is occurring. The scorched Osiris orbits 'only' 7 million kilometres from its yellow Sun-like star and its surface is heated to about 1,000 degrees Celsius. Whereas hydrogen is a very light element - the lightest in fact - oxygen and carbon are much heavier in comparison. This has enabled scientists to conclude that this phenomenon is more efficient than simple evaporation. The gas is essentially ripped away at a speed of more than 35,000 km/hour. "We speculate that even heavier elements such as iron are blown off at this stage as well" says team member Alain Lecavelier des Etangs (Institut d'Astrophysique de Paris, CNRS, France). The whole evaporation mechanism is so distinctive that there is reason to propose the existence of a new class of extrasolar planets - the chthonian planets, a reference to the Greek God Khtôn, used for Greek deities from the hot infernal underworld (also used in the French word autochton). The chthonian planets are thought to be the solid remnant cores of 'evaporated gas giants', orbiting even closer to their parent star than Osiris. The detection of these planets should soon be within reach of current telescopes both on the ground and in space. The discovery of the fierce evaporation process is, according to the scientists, "highly unusual", but may indirectly confirm theories of our own Earth's childhood. "This is a unique case in which such a hydrodynamic escape is directly observed. It has been speculated that Venus, Earth and Mars may have lost their entire original atmospheres during the early part of their lives. Their present atmospheres have their origins in asteroid and cometary impacts and outgassing from the planet interiors", says Vidal-Madjar. Diameter: 1.3 times that of Jupiter. Mass: 0.7 Jupiter masses, 220 Earth masses. Orbit: One-eighth the size of Mercury's orbit around the Sun (7 million kilometres). 3.5 days. Belongs to a type of extrasolar planet known as 'hot Jupiters' -Giant, gaseous planets in low orbits. First confirmed transiting extrasolar planet. Transit: Every 3.5 days, 3 hours in duration. Eclipses 1.5% of the face of the parent star. Surface temperature: About 1,000 degrees Celsius. Complex: sodium in the lower atmosphere, evaporating hydrogen detected in upper atmosphere, oxygen and carbon also in the upper atmosphere. Extended: During the eclipses the upper atmosphere covers 15% of the face of the parent star. What is causing the atmosphere to escape? The planet's outer atmosphere is extended and heated so much by the nearby star that it starts to escape the planet's gravity. Hydrogen, carbon and oxygen boil off in the planet's upper atmosphere under the searing heat of the star. Astronomers estimate the amount of hydrogen gas escaping HD 209458b to be at least 10,000 tonnes per second. Hydrogen tail is 200,000 kilometres long. Evaporation mechanism so tremendous that a whole new class of extrasolar planets, the chthonian planets - the cores of evaporated gas giants, is proposed. Brightness: 7th magnitude star (visible with binoculars). 1999: Discovery. Entered the astronomical Hall of Fame when the extrasolar planet passed in front of its parent star and partly eclipsed it. 2001: Hubble detected the element sodium in the lower part of HD 209458b's atmosphere. 2003: Hydrogen in upper atmosphere detected with Hubble. Signs of evaporation. 2004: Oxygen and carbon detected in upper atmosphere with Hubble. Evaporation mechanism so distinctive that a whole new class of extrasolar planets, the chthonian planets, being the cores of evaporated gas giants, is proposed. A. Vidal-Madjar, lead author of the discovery paper, J.-M. Désert, A. Lecavelier des Etangs, G. Hébrard (all from Institut d'Astrophysique de Paris, France), G. Ballester (University of Arizona, United States), D. Ehrenreich, R. Ferlet (both from Institut d'Astrophysique de Paris, CNRS, France), J. C. McConnell (York University, Toronto, Canada), M. Mayor (Geneve Observatory, Switzerland) and C.D. Parkinson (Caltech/JPL, USA). The team observed four transits of the planet in front of the star with Hubble in October and November 2003 (with Director's Discretionary Time). The observations of structure and chemical make-up of the atmosphere were made in ultraviolet light, using Hubble's spectrograph STIS. Hubble's position above the atmosphere makes it the only telescope that can currently perform these types of ultraviolet studies. The search and the study of extrasolar planets is the aim of several of ESA's scientific missions. Image credit: European Space Agency and Alfred Vidal-Madjar (Institut d'Astrophysique de Paris, CNRS, France).